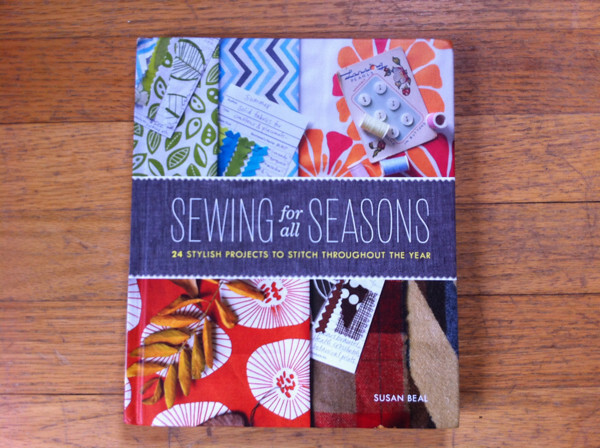 sewing for all seasons release day + giveaways! 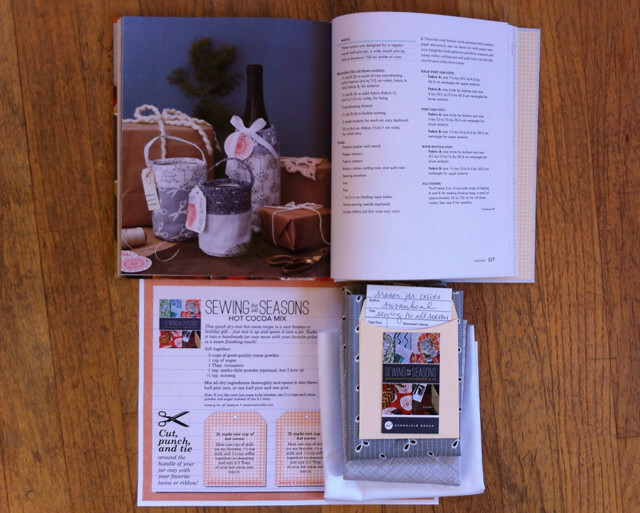 This week was the official release of my new book, Sewing for all Seasons! It’s been a bit of a whirlwind* but I’m super excited to have my book out in the world. You can now find it at Chronicle, Amazon, Barnes & Noble, and Modern Domestic, and get signed copies at Powell’s! So I wanted to celebrate with some book giveaways spotlighting three of my favorite autumn and winter sewing projects, and I would love to send you one of these three prize packages! My daily essential is the simple little coffee-cup cozy I sewed myself last year. I drink a lot of coffee, and I use it pretty much every time I leave the house. 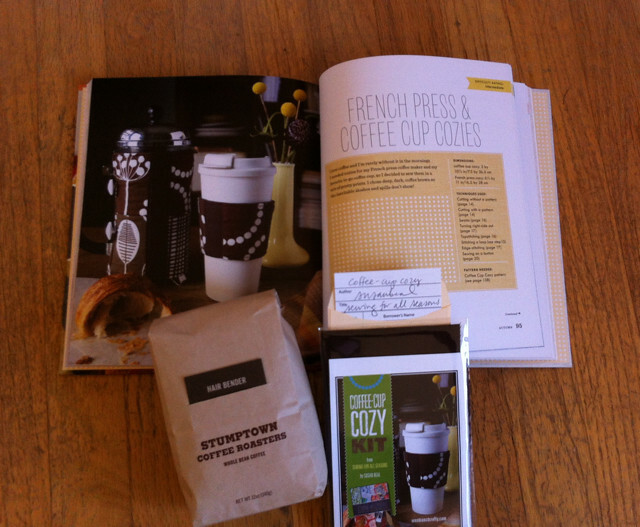 So I paired a signed copy of Sewing for all Seasons with one of the little kits I made up with everything you need to sew your own version of the cup cozy, and a bag of Stumptown Hair Bender (my personal favorite, especially since Michelle reminded me it was named after the barber shop in the space that their very first coffee roastery moved into fourteen years ago). I bought it at the newest outpost in the empire, Roman Candle, the other morning… Portland 2.0 full circle for sure. I’ve mentioned before how much I love Amy of Penny Candy Handmade‘s beautiful work and I’m so excited to share something brand-new we teamed up on! I love to make hot cocoa mix and give a jar of it as a hostess or holiday present, so I was hoping to share the recipe on the page with my Mason Jar Cozies project, as a fun little extra. There wasn’t room for it in the final book design after all, so I saved it to offer up as a free bonus over here! 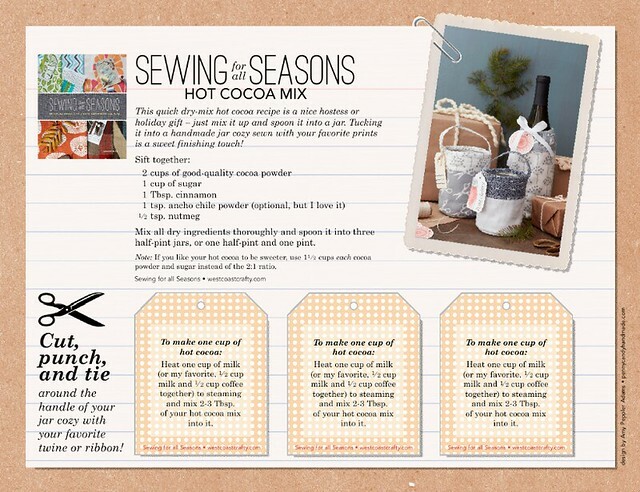 You can download a beautiful one-page printable Sewing for all Seasons Cocoa Recipe Amy designed with the recipe and three pretty tags to label your jars – it’s on the right in the sidebar too! This prize includes a signed copy of my book, two of my favorite Denyse Schmidt and Carolyn Friedlander prints to sew a whole set of cozies, and of course a copy of the hot cocoa recipe and tags. 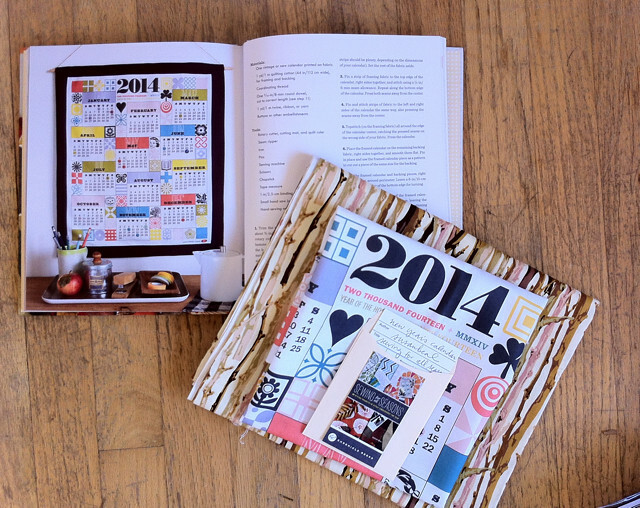 I love my tea-towel calendars and I’m so happy to give away this prize to make your own version for 2014! I paired a signed copy of my book with a FQ of Amy’s wonderful calendar, a Martha Negley trees print, and buttons to sew over your family birthdays. This is another everyday favorite of mine… I love sewing projects that are quick, fun, and useful, and this one makes me happy every time I look at it. I hope you like it, too. To enter: please leave a comment on this post telling me your favorite season, and something you like to make that time of year. It doesn’t have to be sewing, cooking, crafts or any other kind of project is great! I will draw three winners on Friday, October 25 – US and Canada mailing addresses only, please, but I promise I’ll do an international giveaway soon too. Janel of Apartment Therapy wrote such a wonderful review of the book this week. I was so thrilled to see it! 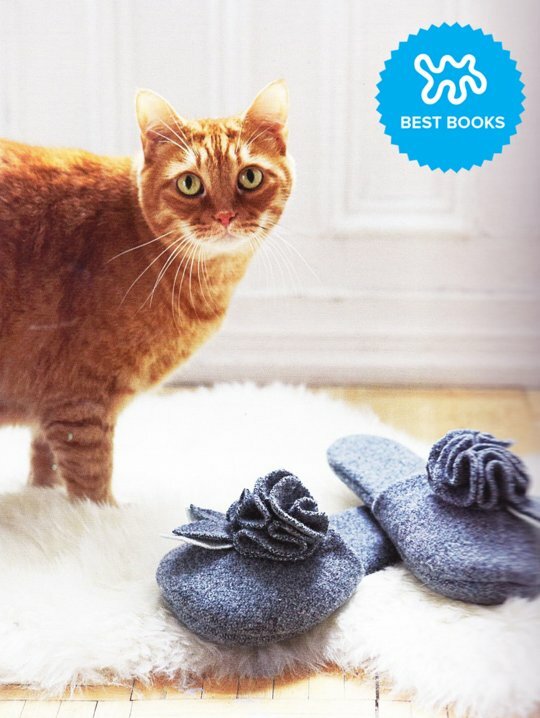 And she picked the amazing photo of the cat with Michelle‘s slippers to spotlight. Awesome. Diane of Craftypod posted a great and thoughtful review of the book with lots of page snaps, so check that out for more photos, too! 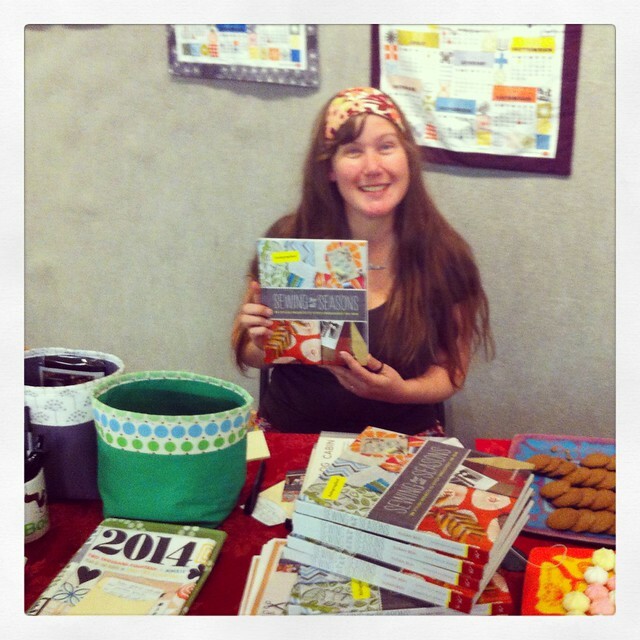 And Amy of Penny Candy Handmade wrote the sweetest post about our collaboration on this wonderful calendar project. She was kind enough to update the awesome 2012 calendar I bought originally two years before the dates were right, and send me gorgeous 2014 fabric to sew with (as a bonus, I found out my 40th birthday will be on a Saturday!). Thank you, Amy! More to come soon but I can’t wait to hear about your favorite things to sew or make all year round. Thank you to everyone who came to Powell’s last weekend (thanks to Kevin for snapping the photo of me above) or Modern Domestic the week before, and to all the friends and strangers alike who have had nice things to say about my new book. I am so grateful! I’m about to head out to teach a mini-version of my Picnic Quilt string block at tonight’s PMQG meeting so keep an eye out for that tutorial going up soon too! *As anyone who’s visited before will probably notice, I just switched from my basic WordPress template of seven years (and counting) to a brand-new blog with all my book sites in one pretty place, courtesy of Alyssa. We are still adding some things here and there but I’m so excited to have this fresh new site instead of six scattered small ones. I will be sharing lots of new tutorials, like the picnic string block, and posting some other bonuses over the next few weeks so please stay tuned for that, too! Congratulations Susan! Another amazing book, I love it and can’t wait to start making some of the projects for Christmas gifts. Your book is so pretty, Susan (and so is your updated website)! Hard to choose a favorite season, but Spring is at the top of my list. This past Spring, I enjoyed visiting Portland Nursery and trying my hand at container gardening for the first time. So many fun plants to choose from! Your book looks amazing! My favorite season is Fall, and I always bake Pumpkin Chocolate Chip cookies. Yum! Congratulations, Susan! Love it and I can’t wait to try the cocoa mix! My favorite season is summer, and all the canning it brings. Congratulations on your beautiful new book! My favorite season is Fall and I love sewing my kids’ Halloween costumes. But – yikes! – need to make 3 costumes in the next week! Beautiful Book! Fall is my favorite season, a perfect time to make bags. I love this book. It is filled with such fun projects! Yay, and congrats again Susan! My favorite climate-related season is summer but I find I am too busy trying to get outside to make anything. 😉 My second favorite season/top “making-stuff” season is Christmas (that’s a season, right?) and I love making holiday cards and candy! I really love discovering small ways to honor seasonal changes in general, but autumn is my favorite. I get excited about the colored leaves, remember how much I love tea, and the crockpot comes out. Homemade soup and bread seem fine for every meal, and suddenly I’m only able to sit in front of the television if knitting or cross-stitch are at hand. It’s a lovely, introspective, creative time, and of course all the most fun holidays are right around the corner. I’ve been oogling your book and put it on my Christmas list…but I don’t think I can wait that long! Super cute! Favorite season by far is Fall. Leaves, preserving, apple pies, soups and stews, freshly baked bread and cozy sewing evenings. Can’t be beat! Congrats on the new book! Congratulations on your book!! I can’t wait to get my hands on a copy. I am a huge fan of springtime. Along with the burst of color, I am always inspired to bake more and refresh the house with new art and organization. My favorite crafty thing is to prepare Passover Plagues and make fun plagues for the Seders we will attend. I love all seasons but since I sew so much, I love to make TIME to get outside and backpack with new recipes that are lightweight and tasty. There is always a quilt to bind in the car on the drive to the mountain. I would absolutely love to win your book, it’s on my Christmas list 🙂 I got to peak at the copy the VMQG received for reviewing and it’s beautiful! My favorite season us autumn. The cool crisp air and changing colours. Fall weather always mashes me run for the pumpkin. Pumpkin flavored anything. And soup. Mmmmm….. I love fall, and enjoy baking all things pumpkin. As a matter of fact, I’ve just pulled out the ingredients for pumpkin muffins that I’m going to make with my daughter after school.. Yum! Congrats on the book! Looks like you have some great projects in there and I’ll have to check it out for sure. Fall i smy favorite season – the pretty leaves and crisp air are great. It puts me in the mood to bake. I too like many others sew year round and like inspirations, projects and ideas to make and share. Congratulations on your first publication. I love the fall for the beautiful weather, and it makes me start making Christmas presents, or at least seriously thinking about them. congrats on the book! I think fall or spring is my fav. I like making homemade loaded potato soup in the cooler months. I also want to make table runners and wall hangings for each season to decorate the house. Thanks for a chance to win! Your book is on my list! I love spring…enjoy thinking up spring and summer outfits to make for my daughter. Congrats on the book – looks wonderful! My favorite season is winter and especially the time around Christmas. Every year, I love to make cookies and Babka, a Polish sweet bread. New to your website and I have enjoyed looking around. Your book looks beautiful! My favorite season is fall and I make as many apple desserts as I can with our delicious local Ohio apples! Summer. I make picnics and Popsicles! I love Spring and Fall. Fall I love to make chili and apple pie and Spring I just like to get outside and work in the garden. Your book looks lovely! Thanks for the chances to win! Pretty new site, pretty new book! I love fall…and I love baking things with pumpkin or apples. It’s perfecting weather for quilting too, I think. What a wonderful book to add to the library! And just in time for Christmas! Thanks for the opportunity to enter your giveaway! Fall is my favorite season and I love to make a big batch of soup every Sunday! I love christmas time, we make mulled wine. I love the way my house smells. My favorite season is fall though, because of how pretty the trees look. Susan congrats! I’ve loved every project I’ve seen and can’t wait to flip through the book again! My favorite season used to be winter, but now maybe it’s summer. I love winter because snuggling up to do any craft while listening to the rain come down is the best. But now with two littles I find it’s fun to do big messy crafts outside with them in the summe, like painting huge canvases! Congratulations on the book it looks wonderful! I think my fav time of year is fall when it gradually gets colder. I just love making quilts. The book looks wonderful! I love all the seasons but especially fall. I’m looking forward to diving into some projects for Christmas gifts! Congrats on the new book! I attended your signing for the Log Cabin Quilting book yet sadly had to miss this time due to cold sniffles. As a sunshine girl, my favorite season is Summer as I love to travel, cook and preserve with all the new bounty of crops from farmer’s markets. The equinox’s of Spring and Fall both bring a freshness and jump to my crative mojo to craft and sew projects for home and gifts for family. Congratulations on another awesome book. And the great new website. You really do amaze me. You are so generous with these giveaways. I’m looking forward to trying out the cocoa recipe. Without a doubt my favorite season is summer, for the weather and temperature – my toes love to be free, but they also run cold so summer is so so nice. But as far as making goes… early fall is awesome – we have such an abundance of great produce and the weather inspires fun cozy baking (pie! muffins! cookies!) and cooking (soup!). Of course spring always triggers my desire to make sundresses and christmas-time has me plotting presents I most certainly can’t pull off in the two weeks my brain reserves for “christmas season”. Favorite season is Fall. 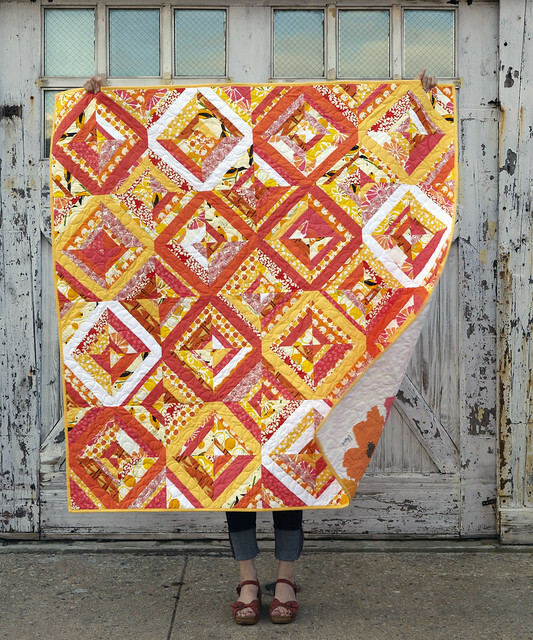 Love to make and get out all the quilts and throws and get cozy! congratulations on the new book, it looks wonderful! my favorite time of the year is fall, I get to start thinking about cozy things to make such as wool shirts and warm quilts. Summer when all the berries ripening is another favorite as Jam is my other favorite thing to make. I love your new book Susan! It turned out so great :). My favorite season is summer, it’s warm, the days are long and there are lots of BBQ’s and picnics with family and friends! I love to make fruit salads for them, and of course quilts to use for our picnics. So excited for your book Susan! Congratulations!! My favorite season is spring and I love to knit socks! I am looking forward to checking out the book. My favorite season is Autumn, and it makes me want to sew cozy things like quilts and cook big meals in the slow cooker. Can’t wait to peek inside your book! When I lived on the east coast autumn was by far the best, now that I’m in the PNW it’s got to be spring. 😀 Strangely enough, as the weather warms up, I tend to have the urge to crochet. Book looks fantastic, especially for a craft-newbie like me 🙂 Autumn is my favorite season: colors are gorgeous, air is crisp, my wedding anniversary is in November and it’s the perfect season for making molasses brown sugar & bourbon ice cream and apple pie. aam also delighted to share mmy familiarity here with colleagues.